Most travelers visit the Similan islands either for scuba diving or snorkeling. 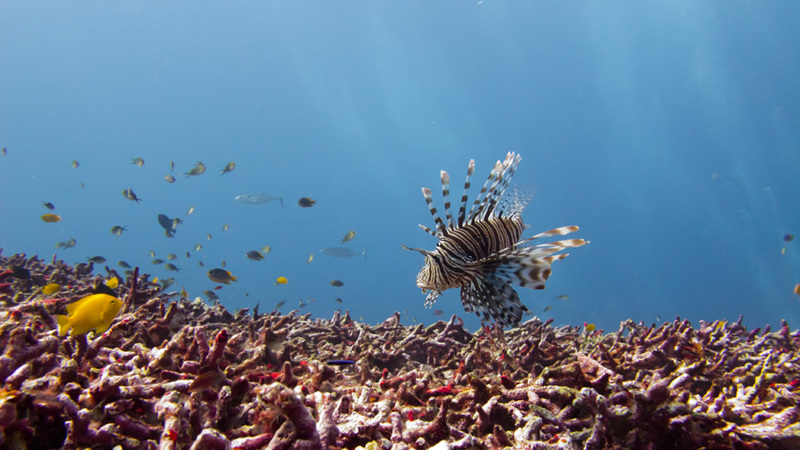 Therefore, through the years Similan diving safaris has become one of the main activities on the Similans. It is because of the extravagant marine life and pristine underwater landscape that attracts divers from around the world. Similan Islands diving is famous all around the world and nominated high in the top dive destinations. It is because of the Andaman Sea is creating perfect water conditions that make the underwater visibility extremely high and suitable for diving and snorkeling. The seawater has an average temperature of 25 degrees Celsius, which is perfect for dive safaris. This makes it possible to dive without a wetsuit in most of the Similan reefs. The Similan Islands diving season start around October and ends in May depending on the weather. The multiple diving spots in the Similan Islands all carry unique features such as stunning coral reefs and giant underwater boulders to explorer. In combination with a spectacular wildlife such as Whale Sharks, Manta Rays, Sharks and millions of colorful tropical fish the Similan Islands dive sites are chosen numerous times as top diving destination in the world by National Geographic, BBC and more leading travel media. 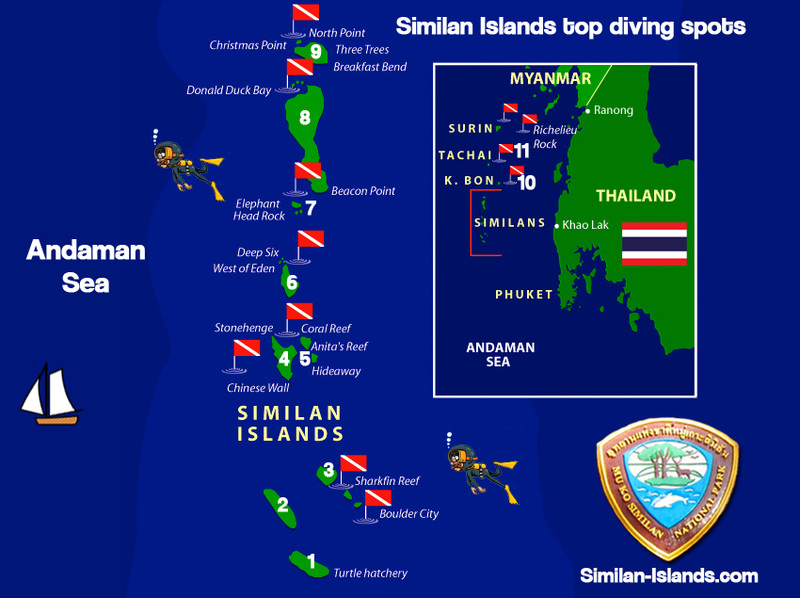 In this article we’ll create an overview of the to diving spots in the Similan Islands.  Similan diving, where to find the best scuba spots? Similan Islands diving is well known all around the world because there are numerous spots that offer unique underwater features. 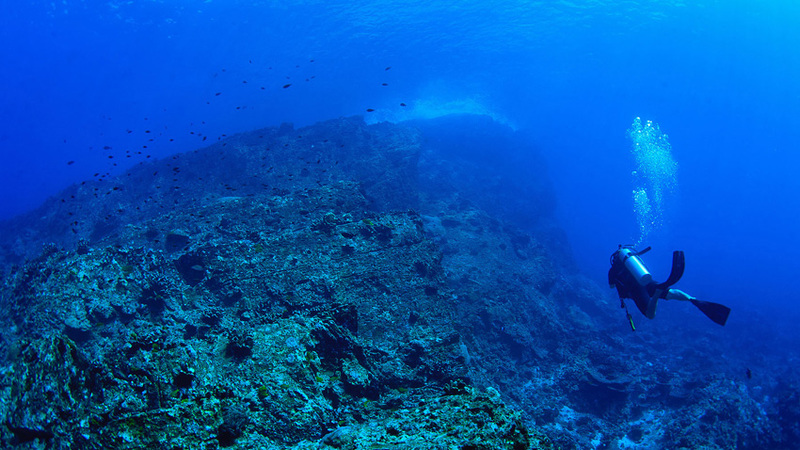 We will tell you exactly what you can expect of each diving spot so you can plan your dives in advance. Either professionals or starters can do diving in the Similan islands, since there are multiple Similan dive centers on different islands that offer various dive courses. It is also one of the few places that make tech diving in Thailand possible. On the Island of Koh Similan you have multiple coral reefs and boulders that are popular diving spots. The best places to start your diving experience in Koh Similan are the Donald Duck Bay or Beacon Point. The Donald Duck Bay is famous for its looks above and underwater. You will be able to spot multiple green turtle species, crustaceans, gastropods, Moray Eels at night and various arrays of shrimps. 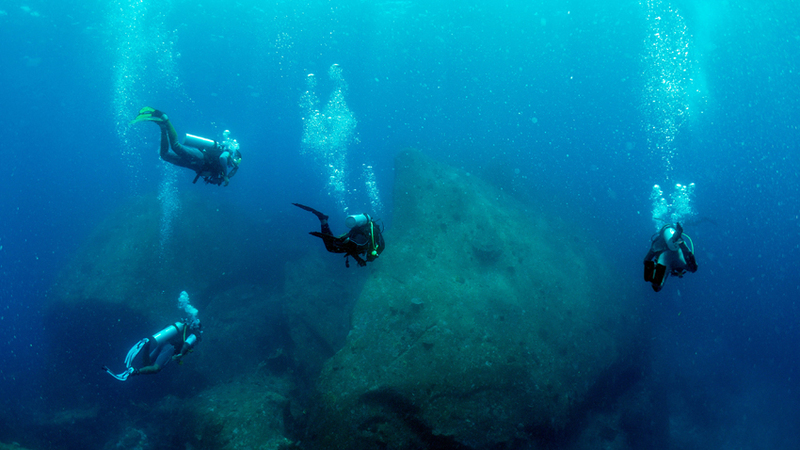 Beacon Point is a very good diving spot for multilevel divers since you can drop down to 40 meters below the surface. It offers stunning boulders and hard corals. Don’t want to dive you can always get your snorkel gear and explore the shallow waters around the beautiful bays of Koh Similan. 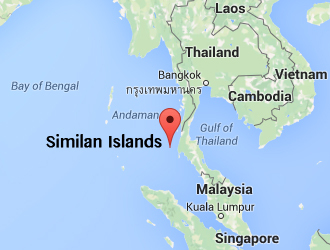 The best Similan Islands diving spots are waiting here to be found and explored. The island Koh Tachai is one of the most popular diving destinations in the Similan Islands. It is also easily accessible via the mainland when you are staying in Khao Lak. Koh Tachai offers various diving spots that are worth to explore such as the Koh Tachai Plateau. Additionally it is close by the beautiful Richelieu Rock diving spot. This is a large horse-shoe shaped site with huge pinnacles surrounded by smaller jutting rocks. The place is full of soft corals, anemones, barrel sponges and large sea fans. You can find Whale Sharks here for most of the year. Around one hour or so by boat north of Koh Tachai you will find the island of Koh Bon. This island is famous for seeing Manta Rays all year round. It is a diving spot for advanced divers since the currents are stronger here than on any other island. The average water depths are around 5-40 meters with a minimum visibility of 15-40 meters! Best to limited your movements when you approach a Manta Ray because when they feel threatened by sudden movements they will swim away and find another place to feed on plankton. You can also find various types of sharks, eagle rays and sometimes a Napoleon wrasse here. The coral reefs of the Similan islands are Thailand’s best and most diverse underwater attraction offering gigantic sea fans and gorgonians, amazing soft corals and giant table coral formations. In the water as clear as gin you are guaranteed encounters with the most beautiful of tropical fish and marine life: from the smallest critters to giant manta rays and whale sharks. The top Similan Islands diving spots are Elephant Rock, Christmas Point, Fantasy Reef, Richelieu Rock and the famous Andaman Reef. The Elephant Rock is the most “famous” dive site at the Similans Islands. The name originates from a rock formation of three that break the surface on the Island of Koh Similan, with the largest of the rocks resembling an elephant head. 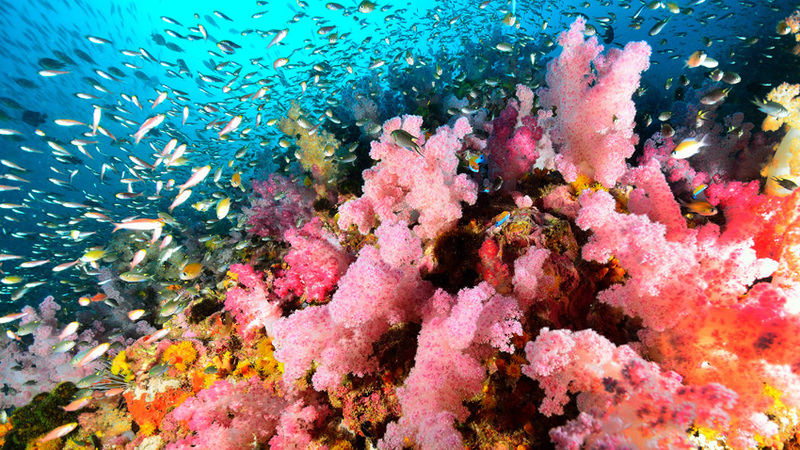 You will find fish and corals in all shapes and sizes matching the colors of a rainbow. Christmas Point offers a spectacular series of underwater pinnacles. 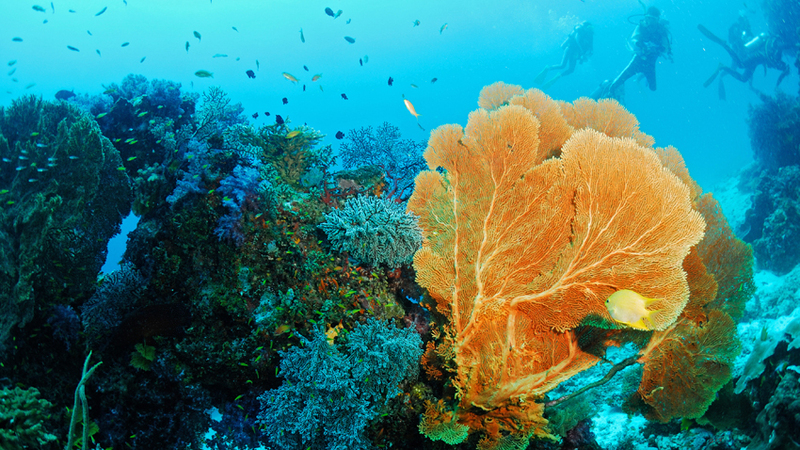 The best spot of the area is around 24 meters deep where you encounter the coral gardens. Diving Christmast Point offers exciting tunnels formed by large rock formations and massive boulders where you can find various large fish such as Pelagics taking a “nap” in the crevices. The favorite of many divers is Fantasea Reef, which offers enormous rocks, some as large as houses that create a spectacular underwater landscape attracting large amounts of fish. The curious and beautiful looking Clown Trigger Fish is one of its natives and you will be able to spot stingrays congregating on the sandy bottom. Richelieu Rock is a large underwater granite pinnacle that rises steeply from a depth of around 40 meters. It barely breaks the surface making it a navigational hazard for boats of all sizes. This diving spot is incredible and offers a large number of anemones, sponges of all shapes and sizes. The soft corals carry the colors of the rainbow and are lining up on the rocks. This is also one of the best Similan Islands divings spots to see the majestic whale sharks basking in the waters. Large numbers of reef fish and shoals of barracuda, jacks, Giant trevally, and other pelagics patrol the Andaman Reef. Huge coral heads scatter the sandy bottom and healthy stag horn coral provide shelter for smaller fish, Moray eels and Lionfish. It is an excellent site for the underwater photography. Anita’s reef is classified as a deep dive and one of the best Similan Islands diving spots. It offers majestic rocks that are teaming of corals and marine life. Read more about Anita’s reef here. Take a chance to explore the diving Similan Islands by snorkeling around in one of the most beautiful areas in Thailand. Similan snorkeling is fun for all ages since the waters are warm and calm.